It is a long-standing article of faith that “.375” is the minimum legal caliber for dangerous game in most African countries. We interpret this to mean the great old .375 H&H, which was introduced in 1912, ignoring all other .375 caliber cartridges—some of which are slower and less powerful and others that are faster and more powerful. However interpreted, it’s mostly a myth. One of the first genuine African “minimums” was decreed in about 1955 by the East African Professional Hunters Association, recommending a minimum of .40 caliber for thick-skinned game. Elsewhere, to this day, some game departments have legal minimums, while others do not. However, the “minimum .375” rule is rare. The European equivalent 9.3mm (.366 inch) is more common. Zimbabwe is unique, with a minimum energy requirement expressed in the European kilojoules. The .375 H&H meets it handily, but the standard is tailored to include the old 9.3x62 Mauser. There is little legal precedent for .375 to be an accepted minimum for dangerous game. As a bullet diameter, the .375 hearkens back to the European 9.5mm (.375), and the development of the .375 H&H was in response to the 9.5mm Mannlicher, which was becoming too popular for Holland & Holland’s taste. So in 1906 Holland introduced the mild .400/.375 Nitro Express. It was the first belted commercial cartridge, but it flopped. In 1912 the company tried again with the .375 H&H Mag. and its companion, the rimmed .375 Flanged Mag. The .375 H&H was powerful and fast, and it still ranks as one of the world’s most versatile cartridges. In 1912 folks were still wrestling with the effects of new smokeless powder velocities and jacketed bullets. The smallbore crowd, led by experienced hunters such as Walter Bell and C.H. Stigand, advocated the deep penetration of heavy bullets in mild 6.5s and 7mms. Others clung to their blackpowder eight-bores, and still others shifted to the new Nitro Express rounds. From l.: .375 H&H, .375 Ruger, .375 Wby. Mag., .375 Rem. Ultra Mag, .378 Wby. Mag. The fastest .375s deliver more energy and shoot flatter, but recoil goes up sharply. 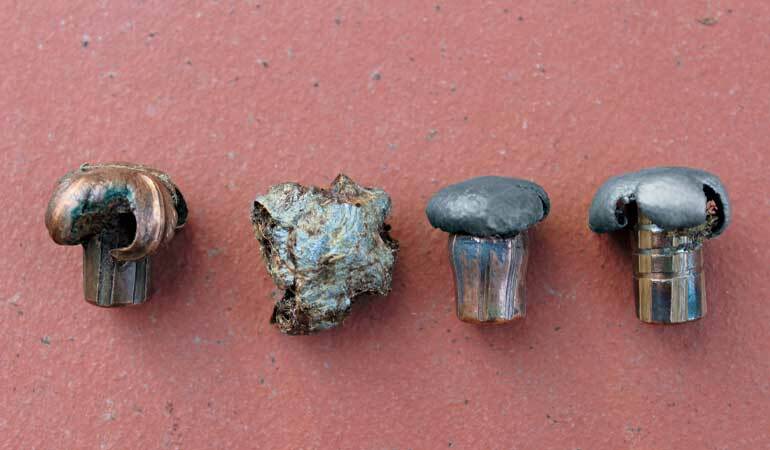 The .375 H&H and .375 Ruger are absolutely adequate for buffalo—without ferocious recoil. Rumors circulated that older smokeless mediums—9x57, 9.3x57, 9.5mm Mannlicher and .400/.375 (think .358 Winchester performance)—were underpowered. The .375 H&H solved that problem, but it wasn’t an overnight success because a small altercation called World War I intervened. By the 1920s the .375 H&H was generally accepted as adequate for the largest game, and with its high velocity and flat trajectory, it was also deemed versatile enough to be used for darn near anything. It was loaded in the United States from 1925 and was an original chambering for the Winchester Model 70 in 1936. 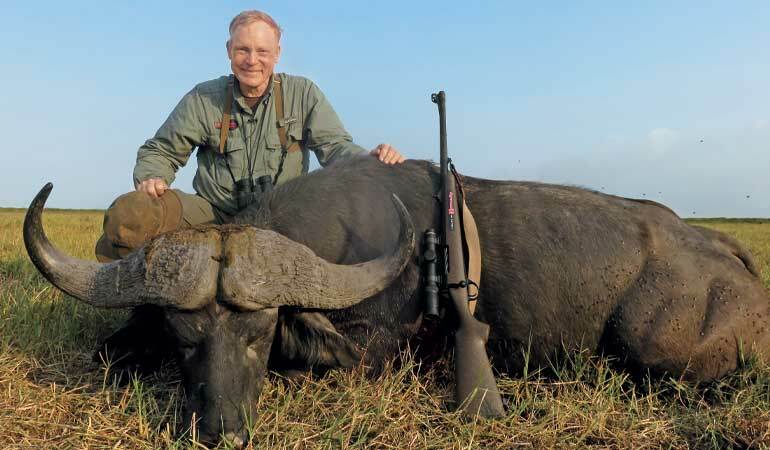 For American hunters it was the choice for large game, but it also had a solid reputation in Africa. Jack O’Connor was a lifelong .375 fan, but he also had, among other big bores, a .416 Rigby. Everybody made .375s, but under England’s proprietary system, only Rigby made .416s, and only Rigby offered ammo—until there wasn’t any. In 1988–89, though, Federal brought out its .416 Rigby load, Remington introduced the .416 Rem. Mag., and Weatherby quickly followed with the .416 Wby. Mag. Krieghoff brought out the rimmed .500/.416 Nitro Express. Hornady and Norma got into the big-bore business, resurrecting old-timers like the .404 Jeffery and .450/.400 Nitro Express. A decade ago, Hornady necked up its .375 Ruger to create the short, fat .416 Ruger, and both Dakota and Holland & Holland are pushing the .400 H&H. Today we have a spate of “.40-plus” cartridges. What does this proliferation of .40 calibers have to do with the .375? Based on correspondence from readers, a lot of folks now question the efficacy of the .375 for buffalo. Early on I had a bad experience with a buffalo while I was using a .375 H&H. I found it easier to blame the cartridge than to blame myself for not shooting the bull in the right place, so I understand their concerns. That’s why I went to a .416 long before the .40s made their comeback. Provided you do your part, the .40 calibers are more decisive on buffalo. 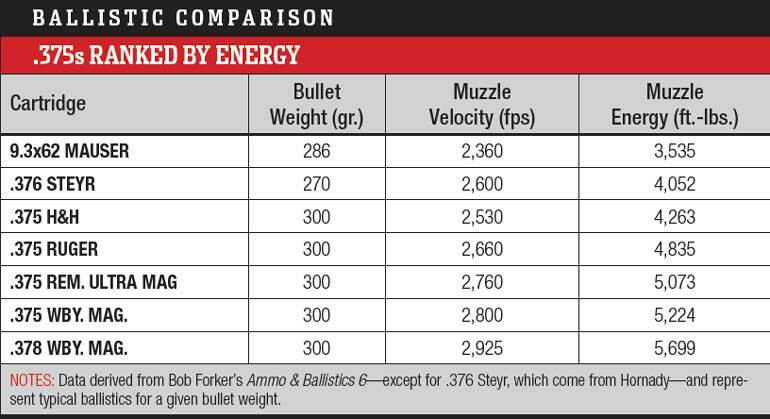 They carry some 100 grains more bullet weight and, depending on velocity, generally deliver more energy. When the bullet performs properly and is placed correctly, you will often get more instant gratification than a .375 can deliver. As admitted, I wounded and lost a buffalo with a .375. I shot too far forward, so I doubt the result would have been different with anything short of a pack howitzer. I was also “admiring” my shot and failed to shoot again, which, perhaps, is a more critical error. The African buffalo isn’t impressed by foot-pounds. The only thing he responds to is a bullet placed squarely in the vitals: brain, spine, heart or both lungs. A shot that catches only one lung is not enough. The buffalo may be recovered, but expect a lengthy and scary tracking job. Cleanly killing a buffalo is all about shot placement, and it’s also important to pick your shot. We all want the perfect broadside shot, but that won’t always happen. Quartering-to is fine; just focus on the point of the shoulder. Slight quartering-away angles are good, but with buffalo you can’t risk strong quartering-away angles. The paunch is like a 30-gallon drum of packed grass and can stop any bullet. The stomach lies to the left, so it’s worse from that side. Broadside or quartering, the most common error is to hit too high. I divide the buffalo into horizontal thirds. The perfect shot is the top of the bottom third, but don’t shoot above the halfway point. Facing shots are common. When sensing danger, a buffalo will often turn to face you with that “you owe me money” look. I like this shot, center of chest about a third up from the brisket, but it’s important to be steady. If you wobble to one side, you’ll catch just one lung, and, again, you have a long day ahead of you. Buffalo are tough, and I believe it’s true they get a massive dose of adrenaline upon receiving a bullet. However, with any of these presentations, a .375 can kill a buffalo with one good expanding bullet. Whether it will or not depends on exactly where the bullet hits and how clearly you visualize the shot. Dark animals confound the eye, and what appears perfectly broadside often isn’t. Given these guidelines on placement and other in-the-field considerations, where does the .375 fit? I’ve shot buffalo with a wide range of cartridges, and I’ve probably taken more with various .375s than anything else. I’ve made more pure one-shot kills with .375s than with anything else. However, buffalo are so tough that, for me, a one-shot kill is accidental. It usually only happens when I’m unable to fire again. However, I’ve seen buffalo taken cleanly with 6.5mms and the 7x57, using the heavy-for-caliber solids like the old-timers used. With heavy modern expanding bullets, I’ve taken buffalo with .30, .33 and .35 calibers. The mild-kicking 9.3x62 is effective. Last year, I killed a nice bull cleanly with a single 286-grain InterLock from a 9.3x74R. That’s just a plain old bullet, and the 9.3x74R is not as powerful as the .375 H&H. So I’m not suggesting the .375 H&H is the starting point for buffalo. If you’re looking for light recoil, consider a 9.3x62, 9.3x74R or .376 Steyr. All will do the job, but none is the equal of the .375 H&H. The .375 H&H is the baseline—and the most popular. Standard ballistics with the 300-grain bullet are 2,530 fps, yielding 4,263 ft.-lbs. This is adequate for any buffalo that walks. Its rimmed twin, the .375 Flanged, is still loaded. The pressure is kept a bit lower for use in double rifles, but I doubt any buffalo would know the difference. The unbelted .375 Ruger, introduced in 2006, has also become popular and is a great choice. The .375 Ruger fits into a .30-06-length action and runs about 100 to 150 fps faster than the .375 H&H, delivering about 500 additional foot-pounds of energy. The three fast .375s—.375 Wby. Mag., .375 Rem. Ultra Mag and .378 Wby. Mag.—are much faster. All produce well over 5,000 ft.-lbs. of energy. This can be seen in the field; these fast .375s hit more like a .416 and also shoot flatter for use on plains game. However, recoil goes up sharply, so these cartridges are not as easy to shoot well as the .375 H&H. Four .375 bullets recovered from buffalo. From l.: Barnes X, Hornady DGX, Swift A-Frame, Federal Trophy Bonded Bearclaw. Basically, all 300-grain .375 bullets are suitable for buffalo. As for which bullet, modern expanding bullets are perfectly fine for buffalo, so fine that I no longer carry solids for follow-up. All 300-grain expanding .375 bullets—and I have used most of the brands—are adequate for buffalo. The bonded-core designs expand more, retain more weight and are “prettier” when recovered, but I have taken many buffalo with non-bonded bullets. Homogeneous alloy designs don’t expand as much but retain almost all their weight and penetrate extremely well—so well that, in herds, I avoid using them because of the risk of over-penetration. 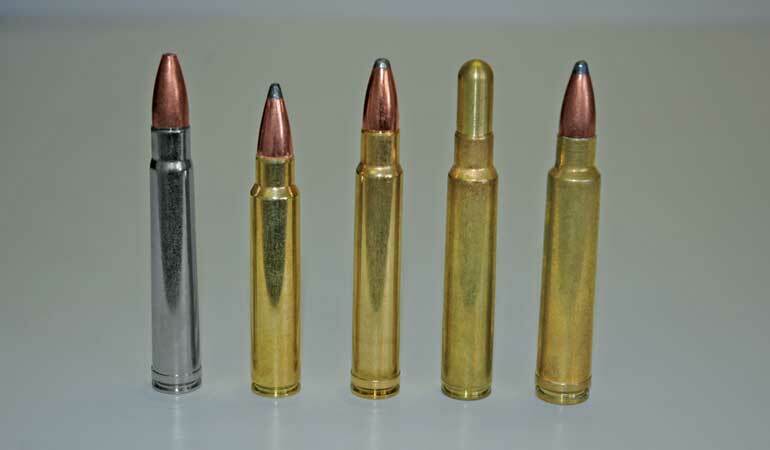 These days there is much hoopla about extra-heavy bullets, such as the 350-grain .375. They’re not new. I used 350-grain bullets back in 1984 and have experimented with them since. I don’t use them much because, to me, the much-reduced velocity robs the .375 of its great versatility. Point of impact is so different it’s not practical to carry both weights, and like I said, I have always found 300-grain bullets to be satisfactory. A little while back, my wife, Donna, and I were on a big herd in coastal Mozambique, perhaps 800 strong. The herd was on the far side of a short-grass savanna, so she and her team crawled forward and closed the distance. The buffalo milled about, suspicious but not alarmed. A good bull stepped to the edge. Donna was sitting behind low sticks with her Blaser .375 H&H mounted with an Aimpoint and loaded with 300-grain Hornady DGX bullets. Her first shot was quartering-to, and it looked perfect from my perspective. The bull took it hard, but moved left along the edge of the herd. When he stopped, she hit him again. He turned back into the herd, and then we saw him go down. Instead of spooking, the herd gathered and advanced a few yards. That was my cue. I was shooting a CZ 550, also in .375 H&H, mounted with a SIG Sauer 1-5X variable and also loaded with 300-grain DGX bullets. We studied the herd. Another good-looking bull stepped to the edge. His body position was nearly frontal when the trigger broke. He bucked, took a couple of steps forward, then went down and bounced back up. Other buffalo closed in, so no chance for a second shot, but we saw him tip over. When the herd moved off, they left behind two dark mounds in the short grass. Total of three shots expended, two bulls down. Yes, the .375 is enough gun for buffalo.